anglers are now able to fish for brook trout in park streams. 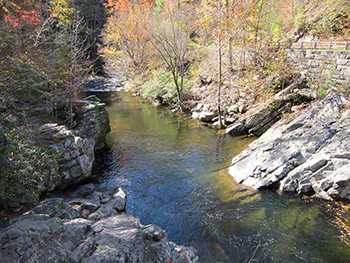 Mountain river running alongside Little River Road between Townsend, TN and Gatlinburg, TN. 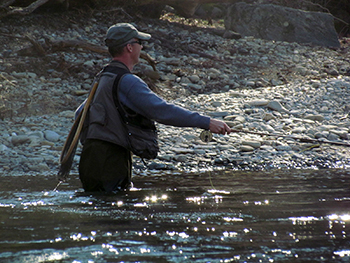 Anglers are often spotted in the river. Image © by Image Builders. Fly fishing in Great Smoky Mountains National Park. Image © by Image Builders. Great Smoky Mountains National Park has about 2,115 miles of streams within its boundaries and protects one of the last wild trout habitats in the eastern United States. The park offers a wide variety of angling experiences from remote, headwater trout streams to large, coolwater smallmouth bass streams. Most streams remain at or near their carrying capacity of fish and offer a great opportunity to catch these species throughout the year. You must possess a valid fishing license or permit which is valid throughout the park, and no trout stamp is required. Fishing licenses and permits are not available in the park, but may be purchased in Wears Valley or you may purchase a license online. Residents and nonresidents age 13 and older must have a valid license. Residents age 65 and older may obtain a special license from the state. Moving rocks is harmful to both fish and aquatic insects that live in the streams. Many fish species the live in the park spawn between April and August. Some of these fish build their nests in small cavities under rocks and even guard the nest. When people move the rock, the nest is destroyed and the eggs and/or young fish die.